I am working on a m2,Hoping to have it running one day, I,m trying to find other that got one or restoring one, I got three halftracks and ww2 army trucks. would like to hear from you. thank you. Well, I got my wxlc3 Hercules engine out of the m2 and taken apart. All looks great, but need a good cleaning, I will blast engine with black diamond and paint grey. I got a nos gen. and voltage reg. and gauges to go back one. Hopefully we'll get some responses for you VJ. Sometimes things get slow here. Thanks Blake, I am just glad you got the site, I got to see pictures, All so got the torque spek. on the rod, main and head bolts from here. Well, still doing a few things on the mg-1 or m2 hst. I got piston rings from hasting, and got them back in the wxlc3 engine. Did blasting on several parts and primered. Also got hold of other m2 folks, so all is looking good. It take time to restore anything, but its a lot of fun. Glad you're getting some good information here. I wish some of the other guys would jump in. I don't visit the site too often but I do have a restored M2 that is close to 100%. I have a second for parts. Is there anything specific that you have questions? Love to see pictures of your progress. Where are you located? Glad you found some of the valve locks. I do have some of needed. I also have a CCKW353 that is currently under restoration. I am also fairly close it you in the Greenville, SC area. You can contact me directly at cletrac.m2@gmail.com if needed. Some pic links of my 44 M2. Thanks for your kind comments. As you well know a lot of work goes into them. If you find yourself in the upstate SC area give me a call. 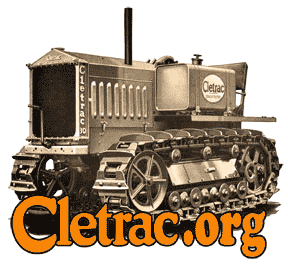 Also let me know if you need any information or parts on the Cletrac. Well, still have the m2, but work has slowed down. I got to get more blasting done, before I set the engine back in m2. Also so I have traded for three m4a1 high speed tractor. but hope to make one m4 out of 3 . I like to take junk and make so thing out of it.That the fun .